Power Tools UK Reviews » Detail Sander Reviews: Which is the Best Detail Sander? Detail Sander Reviews: Which is the Best Detail Sander? So you’ve got to the point where you are considering owning your own detail sander? Or are you just replacing an old one that has seen better days? Well, either way, you must be quite advanced in your DIY-ing career to be getting into detail sanding! The detail sander category of power tools, as we’re sure you’ve already discovered, has a lot of different makes and models from which to choose from and deciding on the best small sander for you can be a bit of a nightmare. To make things clearer, one needs to do a little thinking beforehand on what and how often you will be using it for. Is this just for a one-off DIY job or are you planning to use it for a trade of some sort? Are you going to be using it in a place with easy access to power sockets? What about the dust that is generated when sanding, will you have access to a dust extraction system or vacuum cleaner? Are you going to be using it above shoulder height, in which case the weight of it could have more significance? The more thinking you do in advance on exactly how you intend to use it can go a long way into making the job of choosing the best detail sander for you a lot easier. Mains-powered or Battery-powered – As with most power tools, deciding on whether to go with the mains-powered, more power, less convenient route as opposed to the battery-powered, more convenient power tool, is always one of those early decisions one has to make that narrows down the field of options and usually makes the final decision easier. In the detail sander arena, the field is dominated by the corded-electric variety, so if you do insist on going the battery route, then your options are decidedly more limited to more well-known brands of power tools. One advantage of many battery-powered systems these days is that, if you stick to one brand for all of your battery-powered tools, you can often subscribe to a system where the battery can be shared across a variety of different power tools. Power – For mains-powered detail sanders, power is usually given in Watts and gives the buyer a good idea of how and what he or she can use the small sander on. In the case of battery-powered tools, the battery voltage correlates with the power that the tool can deliver, to put it simply, the more Wattage or voltage, the more power. A more powerful sander means that it can be used more aggressively to take more material off a surface faster and it also means that it can be used on harder materials more effectively. Dust extraction system or dust collection box – All materials produce dust when sanded, some more than others, so the system employed to manage that dust is fairly important. Here one usually has one of two choices, an integral collection system such as a dust collection box with micro-filter, or an external dust extraction system like a vacuum cleaner. Each type has its pros and cons but ultimately, one’s preference usually comes down to how the tool is going to be used. External vacuum systems are much better than dust collection boxes at preventing dust from getting into the surrounding work environment, but then one has to deal with the unwieldy nature of having a vacuum hose attached. 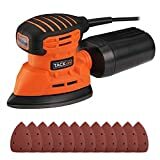 If the sander is the corded-electric type this makes it even more inconvenient as the operator also has to pay attention to not tangling up the wire with the vacuum hose as well. In addition, if the detail sander needs to be used in a more difficult-to-access environment, for example, if the operator is perched precariously up a ladder and/or working above shoulder height, then dragging along a vacuum hose (as well as the electric cord) will take away from the ease of use of employing a power sander in the first place. Weight – The heavier the machine the more fatigue-inducing it will be. If the tool is to be used over shoulder height or for long periods of time, then opting for the smaller and lighter detail sanders is obviously best. Noise level – Most detail sanders are not quiet machines, but they are not excessively noisy either. Most small sanders operate in a similar noise range to each other with the exception of some branded tools that have been specifically designed to be quieter. 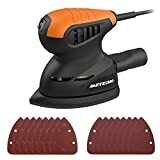 Add-on accessories – Some detail sanders come with small accessory pads that can be clipped on to the power tool that extend the sanding capabilities of the detail sander. For example, a common accessory is the ‘finger’ attachment that clips on to the front of the detail sander to allow it to reach narrower areas that would otherwise be inaccessible. Variable speed – Some small sanders provide the ability to vary their speed of oscillation. This is not an essential feature but does allow the user to remove material from a surface with a greater degree of control. More fragile surfaces may require a gentler sanding action and this can be achieved by slowing down the detail sander using a variable speed control. Design – For the most part, detail sanders come in two flavours. Firstly, the traditional power tool-like design with an elongated body and a triangular-shaped sanding pad, or alternatively, detail sanders that have become more commonly known as palm sanders since they mostly fit into the palm of the hand. Choosing the right type to go for depends on the work one plans to do and individual preference. 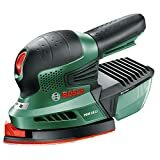 The 180W detail sander under the VonHaus and Silverline brands is a well-built, solid, and powerful detail sander at an excellent price point. Useful for getting into all those nooks and crannies when sanding intricate structures, it is powerful enough to be used on wood, plastic and even metal. It has similar levels of noise and vibration as most other economy small sanders. Due to its weight and vibration, the tool is best operated with two hands, but the overall grip of the sander is quite comfortable and operators tend to have more control over the machine for more intricate movements than they do with the mouse-shaped palm detail sanders. The 180W detail sander has a port on the back of the machine to attach a vacuum, which is essential when sanding particularly ‘dusty’ materials as the dust tends to exit the air vents on the side of the tool straight into the face of the operator if a dust extraction system is not used. Sanding sheets are held on using velcro and are easy to come by, an important consideration since, due to their small size, they are worn down quickly and need replacing on a frequent basis. Of course, one does have to remember that the VonHaus / Silverline 180W detail sander is still a budget power tool, which means that you cannot expect to run the tool for hours on end without regular periods of downtime. Users have reported that overworking the device can lead to it cutting out sometimes permanently due to a burnout and sometimes due to the triggering of an overheat safety-stop mechanism that resets itself once the tool has had a chance to cool down. With the VonHaus brand, the power sander is usually cheaper, coming with a 2-year warranty, and if buying through Amazon is not sufficient peace-of-mind, then VonHaus also has excellent customer service as well. With Silverline, on the other hand, the warranty period is 3 years, but the tool usually costs slightly more upfront. The Einhell TE-DS20E detail sander is a step above the basic economy brands. Einhell power tools tend to be well-designed, robust and reliable, and this Einhell detail sander is no different. The tool performs admirably, tackling sanding in those hard to reach places easily. Unlike some economy brand detail sanders, vibration from the power tool is minimal, and the device tends to be quieter than its competitors. In addition, it has a rubberised grip and is well-weighted, making the detail sander a joy to use. For a high quality German-branded sander, one might expect that its running costs would be higher, however, it uses generic sanding pads that can be easily sourced from a number of different retailers at very reasonable prices. Unlike budget competitors, the Einhell TE-DS20E has variable speed control allowing it to handle even the most delicate of sanding jobs. For dust extraction, it uses a vacuum port at the rear of the tool that can be attached to a bespoke dust extraction system or household vacuum cleaner so long as it has the correctly-sized connection on the vacuum hose. Overall, the Einhell TE-DS20E is an excellent buy for the DIYer in the family, and will even stand up to regular use by a trade professional. The FERM DSM1009 is another detail sander that is best described as a step above the budget detail sanders. It does not have the brand-name reputation that comes with other more expensive detail sanders, but it certainly comes with the higher quality and features that are often associated with the bigger brand names. The FERM detail sander is a powerful machine running a 280W motor, making it relatively heavy and requiring two hands to operate it. However, it is well balanced and with minimal vibration when in use, it can be used for extended periods without muscle-fatigue settling in. The DSM1009 comes with a variable speed control so that more delicate sanding jobs can be tackled at lower oscillation speeds. The quality and features of this detail sander, together with a 3-year manufacturer’s warranty make this detail sander a hard one to beat on overall value for money! FERM is a dutch company that has grown from a small business started in the 1960’s to a medium-sized company that today sells a range of power tools internationally. Being a European company, the DSM1009 originally came with a two-prong European-style electrical plug which required users to use their own European-to-UK plug adapter as none was shipped with the tool, but more recently the company has started making the detail sander specifically for the UK market with a UK-style plug. However, currently when buying from Amazon, it is a little bit of a lottery as to whether new buyers get the UK version or the European version of the tool as the logistics are worked out. The Bosch detail sanders come in two flavours: mains-powered or battery-operated. Bosch makes two mains-powered detail sanders that are available here in the UK: the Bosch PSM 100 A and the Bosch PSM 200 AES. You will also see kicking around a couple of other mains-powered models like the PSM 80 and the Bosch Primo but these are not official UK-based current models (Bosch has replaced the PSM 80 with the more powerful version, the PSM 100 A, and the Primo was made exclusively for the European mainland, not for the UK) although they are still sold here in this country and can be used on UK mains as well. For its battery-operated sanders, Bosch has fielded two models for the UK market: the PSM 10.8 LI and the PSM 18 LI. As one might expect from Bosch, the PSM 100 A is an impressive detail mouse-type sander, being very reliable and robust. It is also very easy to work with, fitting perfectly within the hand, and perfectly designed for getting into those tight spaces, nooks and crannies. In fact, for the price, it is hard to believe the quality you get with these Bosch sanders, but there is a method in the madness. Bosch makes its money not so much from the sale of the sanders themselves but by charging more on the sandpapers that these Bosch sanders use. It is not easy to find a cheaper generic brand of sandpaper that will fit these detail sanders, so you are essentially tied into the Bosch brand once you buy them. For this reason, if you have a lot of sanding to do and you are on a strict budget, then a Bosch mouse-type detail sander might not be the best option for you. The PSM 100 A and the PSM 200 AES are made more for the DIY-er who wants a professional finish and who only needs to do the occasional sanding job around the home. With the PSM 100 A, users have noted a couple of minor dislikes with the dust collection box: Although the dust collection mechanism does an admirable job, it is not perfect and a lot of dust escapes into the air. However, this is not the fault of the sander as dust collection boxes on all sanders are typically less efficient than external extraction systems. The second issue users have noted is that the dust collection box is difficult to remove and requires a surprisingly large amount of force to do so when it needs to be emptied (which can be quite often if you have a lot of sanding to do!). With the PSM 200 AES, you get everything you get with its smaller sibling, the PSM 100 A, but you get a much more powerful sander that can tackle more difficult sanding tasks. However, with greater power comes greater responsibility, and in this case, one needs to be careful not to run the sander so long that the sandpaper gets too hot. Several owners have found that prolonged use of the sander can cause the sandpaper to heat up, so much so as to begin to melt the base to which it is attached. Not something you want to see on your brand-new Bosch sander! The PSM 10.8 LI sander is the first of the battery-operated detail sanders that Bosch offers in the UK. This Bosch mouse-type sander is small and compact, lightweight and easy to use, exactly what one wants in a detail sander. Being battery powered means there are no cords to get in the way, and it also means that the detail sander can be used anywhere, including in areas where access to mains power is a challenge. For instance, sanding areas above shoulder height is a pleasure with this Bosch detail sander. However, as with all things battery powered, there is a limit to the length of time one can keep the tool operating for, so for very large sanding jobs, it might be better to go for a mains-powered sander, unless you have some spare charged 10.8V Bosch batteries lying around that you can swap into the device to keep it going. This may not be as unreasonable an idea as it might first appear. If you are a Bosch aficionado, then you will probably already be aware of Bosch’s universal battery systems, where the same batteries can be used in several different Bosch tools. In the case of the Bosch 10.8 LI mouse-type sander, it is powered by Bosch’s 10.8V Li-ion battery system. The second of the battery-powered detail sanders from Bosch is the Bosch PSM 18 LI. Once again Bosch has made a powerful little mouse-type sander that is lightweight and easy on the hands. The PSM 18 LI can be used with both the dust collection box or with an external dust extraction system like a vacuum cleaner. Since the Bosch sander is already electrically-cordless, using the dust collection box over the external vacuum system is often preferred since it frees the operator from any form of attachment. Indeed, sometimes it is the only way to get certain types of jobs done, like doing sanding work while high up on a ladder. However, if it is more important to ensure that the majority of dust is captured, then using a dust extraction system can also easily be attached to the device in place of the collection box. The 18V battery on the PSM 18 LI lasts a couple of hours or so of continual use, but once again, the Bosch PSM 18 LI subscribes to Bosch’s universal battery systems, this time for the 18V battery, which means that the same 18V batteries used across a range of other Bosch 18V Li-ion battery powered tools can be swapped in to be used on this detail sander as well. Taking into account its pedigree, the design and the universal battery system, the Bosch PSM 18 LI is considered very good value for money. The detail sander from Apollo Precision Tools is a powerful machine that will perform well even on some of the toughest sanding jobs. It weighs approximately 1.2 kg and has a sound power rating of about 86 dB, not dissimilar to other palm sanders in its category. The Apollo detail sander is aimed at the frugal DIY-er looking to do the odd bit of detail sanding, and at its low price point, it will certainly live up to the task. However, one has to remember that this is not a professional machine and as such has not been built robustly enough to withstand the intense workload of a tradesman or carpenter. Indeed, some users have reported that with heavy use the base can break away from the main body, in the process revealing that it is only attached by a small number of connectors made of plastic – not the most robust of materials! One thing to remember with the Apollo detail sander, and detail sanders in general, is not to press down too hard when using them, but instead let the machine do the work. It may take a little longer to get the desired result but by applying only light pressure will avoid the premature failure of the unit as well as preventing the sand paper from inadvertently tearing. In addition, as with all powerful sanders, the Apollo detail sander generates a lot of vibration and care should also be taken, for operator health reasons, to not use it over too extended a period of time. On the more negative side, users have reported a couple of specific dislikes with the Apollo detail sander. Firstly, the power cord that is attached to the sander is too short for most typical uses coming in at only about 1 m long and, with no way to easily replace it, an extension cord is almost always required. The second dislike with the Apollo detail sander has to do with the dust collection box which is not always very effective and becomes easily clogged particularly when sanding finer substrates. However, this is not unique to the Apollo sander as dust collection boxes in general usually suffer from a similar problem even on more professional machines. A dust extraction system is always preferred if one is readily available. In conclusion, the Apollo detail sander is a cheap and cheerful unit that will satisfy the majority of non-tradesmen looking to complete a specific detail sanding job or for hobby work. While for those that test the sander to its breaking point, or if you happen to be unlucky enough to receive a faulty unit, one can rest assured that the detail sander is supported by Apollo Tools customer service which is usually very responsive and, in the past, has gone out of its way to help solve problems that users have encountered. The Black+Decker Mouse detail sander is another excellent option for those small difficult-to-access sanding jobs. The unit has been designed to feel just the right size in the hand and is very comfortable to use. The sander is aimed primarily at the DIY-er who needs it for the odd small sanding job around the home. One of the nice features of the small sander is the finger-like attachment that can be inserted into the the front of the sanding pad, extending the reach of the sander so that it can get into even smaller space-restricted areas. Unlike a number of other detail sanders, the Mouse sander has a vacuum port as opposed to a dust collection box. Attaching an external extraction system or vacuum cleaner is always the preferred method for a cleaner work environment, but with a vacuum hose and electrical cord attached it can be a bit of a nightmare to keep all the ‘cords’ tidy, especially if the sander is being used away from the workbench. 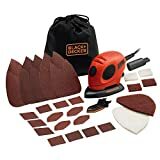 As with some other big-brand detail sanders, the Black+Decker Mouse sander requires Black+Decker-branded sandpaper for a correct fitting, however, this premium-brand sandpaper is more expensive than generic brands, and can make running costs considerably higher. As a result, more avid users of the Mouse sander have tended to devise ways of getting around this ‘lock-in’ by cutting generic sanding sheets to the size required by the Mouse and sticking it on to old used Black+Decker sanding sheets with adhesive – a more inconvenient technique but worthwhile if you are working on a tight budget. One thing to remember with the Black+Decker Mouse sander is that it is best suited for small areas of detail work and not for large areas where a bigger sanding tool would be more appropriate. In addition, the Black+Decker-brand is also primarily aimed at light use by a DIY-er and not for professional use. Consequently, some owners who have over-worked the Mouse sander have reported that its motor can fail if over-stressed, sometimes spectacularly! As with most generic brands of detail palm sanders, the VonHaus palm sander is best targeted at the light-using DIY-er and not at the heavy-using trade professional. This Vonhaus detail sander is small and easy on the hands, and can easily be used with just one hand. With its medium-sized 130W motor it is able to handle most low-intensity DIY detail sanding jobs. Noise-wise, it is quite a loud sander but not uncomfortably so. The VonHaus uses a vacuum port for dust extraction, however, the port size is not designed to any standard vacuum hose size so a bit of fiddling and innovation will be needed on the part of the operator to get it to mate successfully with most brands of vacuum cleaner or dust extraction system (although some Dyson vacuum cleaner models have been found to fit). Unlike some of the bigger brand-name sanders, sanding sheets for the Vonhaus detail palm sander are very reasonably priced, so running costs for this power tool will be very low. Another day, another economy-brand detail palm sander. As with most Wolf-branded tools, the Wolf palm sander is a robust tool that is built with hard-wearing components, yet at a very economical price. Wolf has also prioritised power on this palm sander with its 180W motor, quite high for this size sander. As a result of these design decisions, the Wolf sander is weightier than other competitor palm sanders but able to handle tougher jobs. Unlike some of its competitors, the Wolf palm sander is more of a multi-sander than a straight detail sander coming with both rectangular and circular sanding base plates that can be used in place of the more common triangular one. Wolf tools are most often sold via the TV’s UK Home Shopping Network, where they sell a wide range of Wolf-branded tools. In general, Wolf tools are robust and inexpensive, with aesthetics tending to take a back seat. In this respect the Wolf detail sander is quite noisy, and the dust extraction system empties into a badly-designed dust bag, which tends to inadvertently come off more easily than a dust box. The detail palm sander KAT150B by GMC is another detail sander available in the UK that best fits into the category of budget detail sander as buying one will not likely break the bank. The machine is sturdy, reasonably powerful and fits nicely in the palm of the hand. GMC tools generally do not have the advantage of being a big-name brand but the tools they offer are usually well-designed, robust and very reliable, and at a very reasonable price. The KAT150B is one of those tools and most owners are usually surprised at how good they are. One niggle with the KAT150B is that it does not come with any option to collect the dust other than via an external dust extraction system. Using a vacuum system is not always convenient in every job situation, and if a vacuum is not available, you will just have to put up with the dusty mess that the KAT150B can create. One final note, although the GMC detail sander comes with a set of starter sanding sheets, when it comes time to buy replacements, double check they are the right size. This is especially true if buying the detail sander from Amazon, where some buyers have reported that some of the ‘add-on purchase’ Amazon suggestions for replacement sanding sheets are not the correct type for the GMC KAT150B. Another well-known brand of power tools in the UK is the Worx brand. Worx has a number of power sanders available for consumers to purchase, two of which are the corded detail palm sanders, the WX647 and the WX648. These devices are in the low-power category of detail sanders not dissimilar to the mouse-type sanders from Black& Decker and Bosch reviewed elsewhere on this page, and have power ratings of 55W and 65W, respectively. As a consequence they are some of the smallest and lightest sanders one can get for DIY detail sanding jobs. The Worx detail sanders run at a constant orbital speed of 11,000 RPM without any variable speed functionality and exhibit relatively low vibration making them easy on hands when doing prolonged detail sanding. The Worx machines are also not very loud when in use, although they are surprisingly noisier than expected considering their small size. Accessories-wise, the Worx sanders come with the all-important finger attachment, that attaches to the front of the devices, and allows for more detailed sanding in very confined spaces. Unfortunately, the finger accessory needs to be affixed to the main sander body using a screwdriver making it a little less convenient to use than we would have liked. The Worx sanders also come with a pull-string bag for their storage and transportation, however we would have preferred to see these devices come with their own plastic case for better protection and storage. As for sander sheets, the Worx detail sanders use the hook and loop system for attaching sander paper and the devices themselves come with a small sample of standard sanding sheets and paint removal sanding pads included in the box. However, getting hold of compatible replacement sanding pads once the included ones have been used up can be a little bit of a chore as the company behind Worx does not sell replacements. Instead, owners of the Worx detail sanders have to hunt around a little for generic type sanding sheets that fit the small devices. Generic sanding pads can often be found on Amazon, however determining whether the pads on sale are of the correct size and type without seeing the physical product can make it difficult to get the right ones. Fortunately, compatible generic sanding pads can also often be found in the big-name UK DIY stores such as B&Q or ScrewFix, where one also has the advantage of being able to physically match up potential candidates with the devices themselves or with old sanding pads – just remember not to throw away at least one of the old sanding pads so that you can take it with you to match it to potential replacements. Also, don’t forget to make sure that the punched holes on generic pads line up with the suction holes on the sanders so that dust collection is not interfered with, unless you are planning to use the machines without dust collection which would still work fine but would be a lot messier. So which Worx corded detail palm sander should you get, the WX647 or the WX648? The two detail sanders are essentially the same machine but with a few minor differences. First of all, the WX648 is a little higher powered at 65W compared to the 55W WX647. We are not sure about the reason for this discrepancy, but practically-speaking, the difference is minor and will not be noticeable in a side-by-side comparison. Another difference between the two Worx sanders is in the dust collection apparatus that comes with the devices. The Worx WX647 does not come with a dust collection box but comes with a vacuum hose attachment instead which can be used to attach to a vacuum system for dust aspiration. The WX648, on the other hand, comes with a dust collection box but no vacuum hose attachment. Which one to get depends on personal working style and situation, but we always recommend using a vacuum system when sanding for a cleaner work environment. Finally, the two small detail sanders from Worx come with different quantities of sample sanding pads with the WX648 coming with 16 main sheets + 6 finger sanding sheets, while the WX647 includes only 9 main sheets and 3 finger sanding pads. 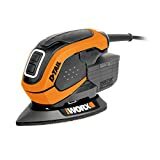 The Worx brand is one of the major brands of Positec, a Chinese-founded company (which also has a branch in the United States) that has been making DIY and gardening tools for the consumer for the past 25 years. Positec first began life manufacturing power tools for other retailer brands before launching their own lines of power tools under the Worx brand and then the US-centric Rockwell tools brand. As of today, Worx and Rockwell tools are stocked at many of the major retailers in the UK and US respectively and have gained a reputation for being of good quality. You may not have heard of the Skil Tools company, but you have almost certainly heard of Bosch. Well, Skil Tools has just as deep a heritage (albeit American) as Bosch does, with this relatively unknown company dating back to early last century. And if that’s not enough for you, then you may be intrigued to know that Skil Tools has actually been a wholly-owned subsidiary of Bosch since the 1990’s. That is sure to get your attention now! As a consequence of its pedigree and relative lack of fame, power tools from Skil tend to be of high quality but without the big-brand price tag that would normally be associated with a premium tool. The Skil 7226AE sander is just such a tool. In fact, the sander is more than just a detail sander, and is appropriately referred to as a ‘Multi-sander’ as the sanding pad can be replaced with various heads, one of which is for detail sanding. The 7226AE is laden with ample power (250W), features and durable components that make it a joy to own and use, and makes it a contender for the top spot in the best small sander category! The EMS180RV sander from Ryobi is a multi-sander rather than a detail sander but it can be used for detail sanding jobs such as fine finishing and paint removal. 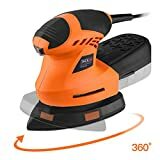 It incorporates a variable speed functionality (6, 000-12, 000 rpm) that allows it to deal with more delicate surfaces, and has a integrated finger sander extension that facilitates sanding in difficult-to-reach locations. Due to its multi-sander versatility, the Ryobi EMS180RV is relatively heavy at 1.4 kg compared to other small sanders while noise levels from it are about average for this category of sander. The sander uses the typical quick-fit hook-and-loop mechanism (colloquially known as ‘Velcro’) for triangular sanding sheet attachment, but the triangular sanding sheets themselves, which are 168 mm by 100 mm, are relatively hard to come by. On the other hand, the EMS180RV can use normal 1/3 sanding sheets as well as 1/3 hook-and-loop sheets – although in this configuration the sander is not really designed for detail sanding. Operation of the sander reveals that dust capture using the attached dust collection box is relatively good but as with any sander, it does not prevent all of the dust from escaping, with some dust exiting the air vents in the direction of the operator if he or she is not careful. One aspect of the Ryobi EMS180RV sander to take note of is that users have found that the palm grip on the machine is quite wide and, for people with small hands or insufficient hand strength, this can make holding the sander for any length of time an uncomfortable task. Build-wise, the Ryobi EMS180RV is not the most robust small sander on the market, so may not be ideal for the professional tradesman, but this is perhaps not surprising since the power sander is relatively inexpensive and more designed for the occasional DIYer. Fortunately Ryobi is a well-established power tool company and in the event of a breakdown, replacement parts for the EMS180RV can be relatively easily sourced from the local Ryobi service agent.